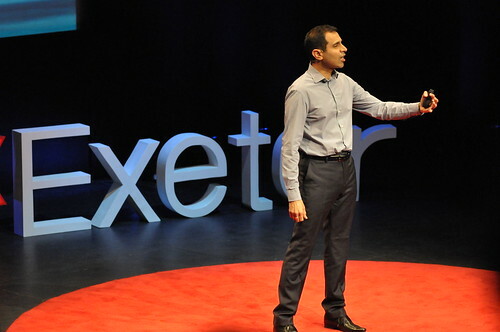 In the lead up to the TEDxExeter 2013 event on the theme of “Living the Questions”, we are planning a series of questionings, inquiries and interrogations. We hope they will trigger new reflections and lines of thought for you. If among our ponderings, ratiocinations and ruminations we do happen to stumble upon any answers, we cannot guarantee that they will be your answers. By all means add your tu’p’orth in the comments. An easy one to get things started: Who am I? 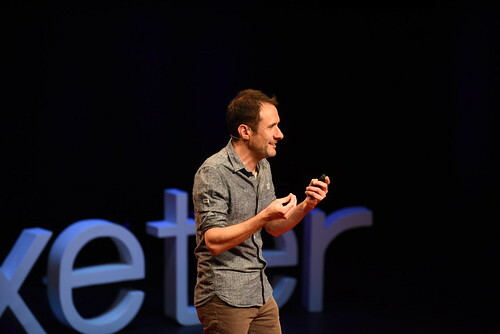 Well, I could just answer: “I am the TEDxExeter storyteller”. But there, blam! Right away I have identified with a role and made myself less than I am. It’s the same when you are making polite small-talk , and they say: “I am a lawyer”, or “I am a teacher”. Is that all? “I practise law as a profession”, is maybe admirable, but “I am a lawyer”? No. Type “Who am I?” into Google, and you can find out more about the Jackie Chan 1998 film of that name. Also, two more questions pop up: What makes you uniquely you? and Who am I meant to be? The Science Museum’s website says that it’s Who am I? gallery provides insights into genetics and brain science. These may explain why I am unique, begging the nature-nurture question, but they cannot tell me who I am. Nor is Descartes’ “I think, therefore I am” enough. I am not just a product of my thought processes, a mind in isolation from my body, emotions, will or soul. If I watch my emotions as a detached observer, I can see how they change like the clouds that float on high, and how meaningless it is to say “I am depressed” or “I am happy”. I might be feeling depressed right now, or full of happiness, but it will pass. The cloud will float by. Likewise, I am not my body. I have a body, and possessing is a fundamental aspect of my existence, but I must not confuse having with being. Despite the insistence of most media and advertising. As for Oprah’s “Who am I meant to be?” let’s at least try and stay in the present (quite apart from the can of worms that that “meant” opens). “Life is not hurrying on to a receding future, nor hankering after an imagined past” wrote RS Thomas. 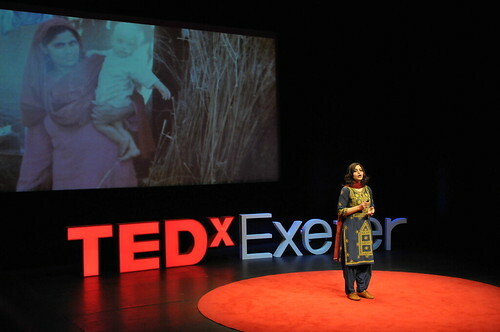 Bandi Mbubi spoke at TEDxExeter 2012 about how our mobile phones, computers and game consoles have a bloody past — tied to tantalum mining, which funds the war in the Democratic Republic of the Congo. 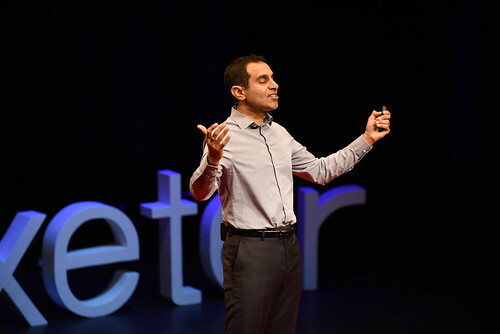 Drawing on his personal story, activist and refugee he gave a stirring call to action. 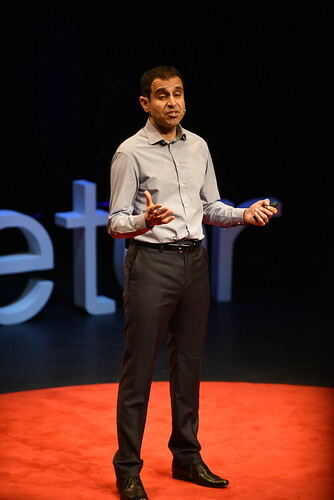 So stirring, that his talk was one of the few chosen each month to be featured on TED.com. As of September this year, there had been 19,900 TEDxTalks, of which only 196 talks had been featured on TED.com. Moreover, the talk was highlighted on September’s State of the X blog. 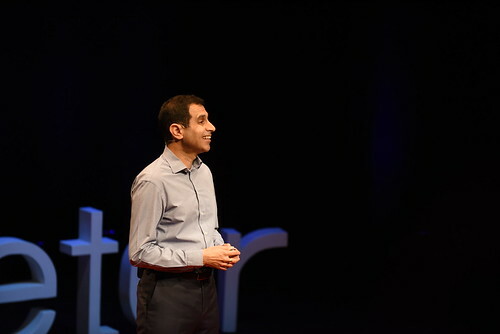 It has been viewed on TED.com nearly 175,000 times. Since April, there has been much enthusiasm and interest in working towards fairtrade phones and clean mineral campaigns. A very real human momentum has built up in response to Bandi’s talk, resulting in the launch of the Congo Calling campaign. Bandi has spoken on conflict minerals at Campus Party, the international technology conference held in Berlin, and participated in the Centre for African Development and Security/SOAS Round table on Conflict Minerals. 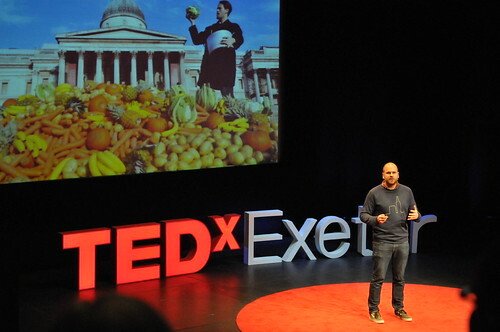 He is supporting student groups, including Exeter University, in their campaigns for conflict mineral free campuses. 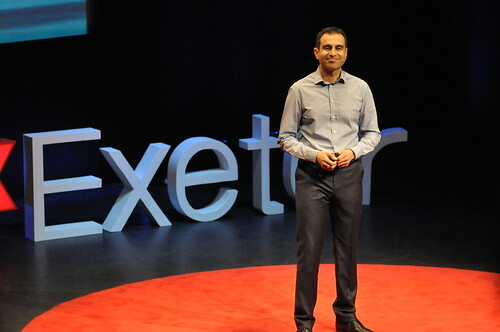 At TEDxExeter, Bandi had only 9 minutes to share his message. 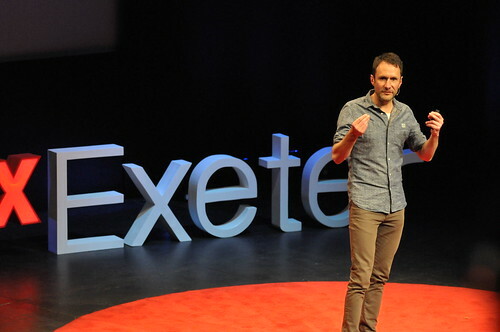 But he is returning to Exeter on 29 November to speak in more depth about the DR Congo and the campaign. It will be a great opportunity to learn about the issues and what actions we can take, and discuss our response. Tickets are £5 only, and can be booked on the Eventbrite website. 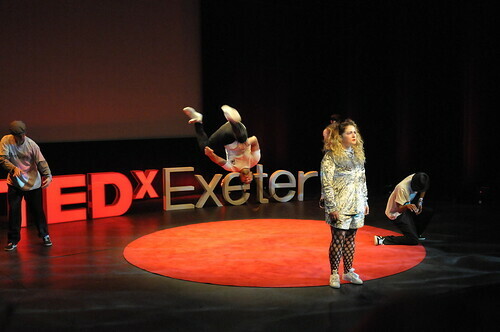 Tickets for TEDxExeter 2013 go on sale tomorrow at the Exeter Northcott Theatre box office, to Friends of the Northcott, and will be available from 30 November for general bookings. We are on Twitter. Boy are we on Twitter in a big way, thanks to the tireless Clive. If you are too, please retweet our tweets to your followers. We are on Facebook. Please come and like our page, share and comment, and do all the good connecting things that Facebook allows you to do. We are on Google+. Follow us and add us to your circles, and keep pressing those +1 buttons. Subscribe to our blog feed to get access to the latest website content, and share share share. Please share our website content on your social networks. See that dark grey button with ‘Share’ on it? Yes, that’s the one. 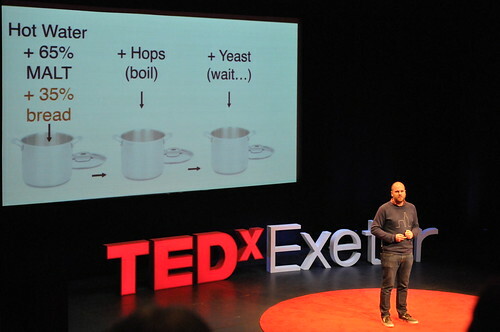 Watch the TEDxExeter 2012 talks again, not least the talks by Scilla Elworthy and Bandi Mbubi as published on TED.com. Pass the links around your friends, and add your voice to the discussion. And finally, tell us about your blog posts and articles and anything else in response to the ideas you’ve heard at TEDx. 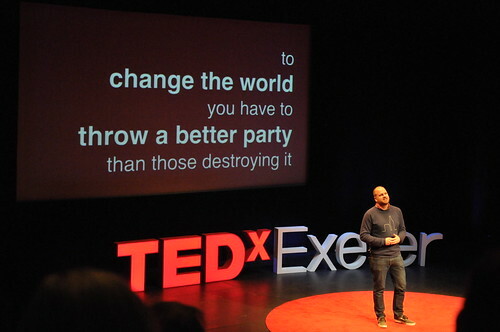 How you can support TEDxExeter: Come in 2013! We have gathered another group of outstanding innovators, activists and performers who are changing the world through their ground breaking work and ideas. 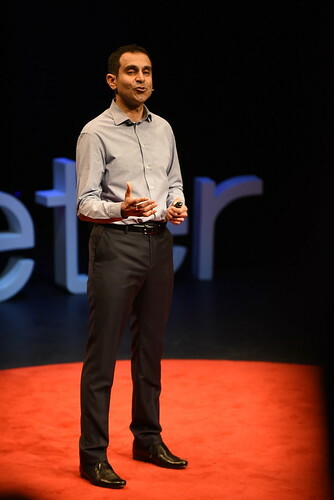 We will explore how to live the important questions facing us in all areas of life, including money, business, prosperity, sustainability, the environment, childhood and old age, community, society, science. Join us on 12 April 2013 to hear from Jonathon Porritt, Kirsty Schneeberger, Patrick Holden, Pam Warhurst, Peter Owen-Jones, and many more. Tickets will be available from the Exeter Northcott Theatre box office from 23 November (to Friends of the Northcott) and 30 November (general booking). 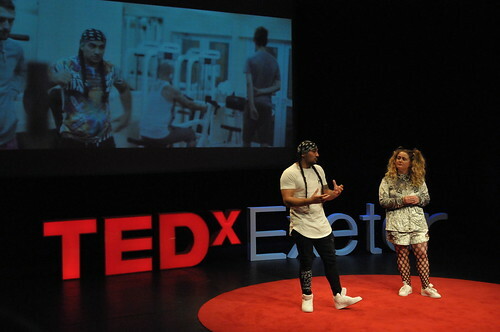 TEDxExeter is a not-for-profit initiative. 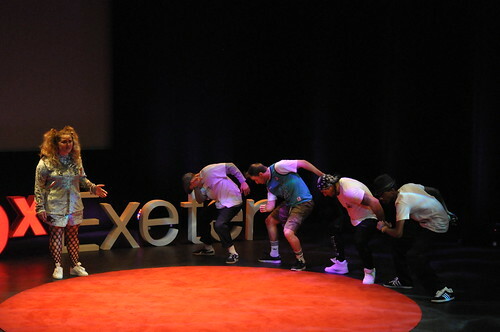 All speakers and entertainers take part on a no-fee basis and the TEDxExeter team give their time voluntarily. 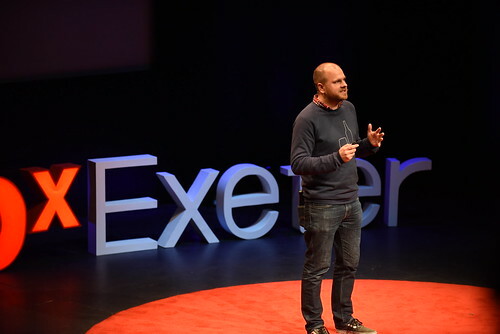 We very much want to make TEDxExeter accessible to a wide cross section of our community. To enable us to do this, we need your support! 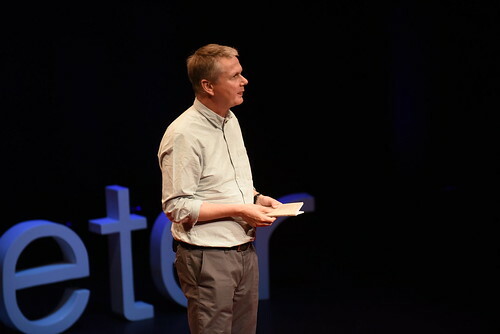 The generous support of our 2012 sponsors made a real difference to making our first TEDxExeter conference a great success. To find out more about your organisation’s sponsorship opportunities in 2013, sponsor recognition, and to download the full sponsorship pack, please see our Sponsors page. 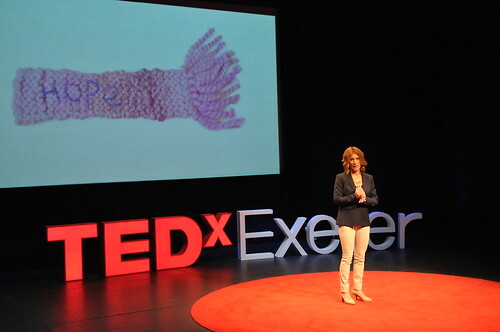 To discuss the opportunities for sponsoring TEDxExeter 2013, please contact the organiser Claire Kennedy. Jonathon Porritt, Co-Founder of Forum for the Future, is an eminent writer, broadcaster and commentator on sustainable development. Established in 1996, Forum for the Future is now the UK’s leading sustainable development charity, with 70 staff and over buy adderall and xanax online 100 partner organisations including some of the world’s leading companies. In addition, he is Co-Director of The Prince of Wales’s Business and Sustainability Programme which runs Seminars for senior executives around the world. He is a Non-Executive Director of Wessex Water, and of Willmott Dixon Holdings. He is a Trustee of the Ashden Awards for Sustainable Energy, and is involved in the work of many NGOs and charities as Patron, Chair or Special Adviser. He was formerly Director of Friends of the Earth (1984-90); co-chair of the Green Party (1980-83) of which he is still a member; chair of UNED-UK (1993-96); chair of Sustainability South West, the South West Round Table for Sustainable Development (1999-2001); a Trustee of WWF UK (1991-2005); a member of the Board of the South West Regional Development Agency (1999-2008). He stood down as Chairman of the UK Sustainable Development Commission in July 2009 after nine years providing high-level advice to Government Ministers. Jonathan’s books include Capitalism As If The World Matters (Earthscan, revised 2007); Globalism & Regionalism (Black Dog 2008); and Living Within Our Means (Forum for the Future 2009). Stewart Wallis joined nef (the new economics foundation) as Executive Director in 2003. His interests include global governance, functioning of markets, links between development and environmental agendas, the future of capitalism and the moral economy. Stewart graduated in Natural Sciences from Cambridge University. His career began in marketing and sales with Rio Tinto Zinc followed by a Masters Degree in Business and Economics at London Business School. He spent seven years with the World Bank in Washington DC working on industrial and financial development in East Asia. He then worked for Robinson Packaging in Derbyshire for nine years, the last five as Managing Director, leading a successful business turnaround. 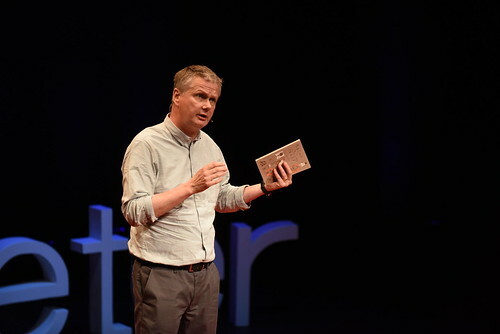 Stewart joined Oxfam in 1992 as International Director with responsibility, latterly, for 2500 staff in 70 countries and for all Oxfam’s policy, research, development and emergency work worldwide. He was awarded the OBE for services to Oxfam in 2002. Pam Warhurst co-founded Incredible Edible Todmorden, a local food partnership that encourages community engagement through local growing. Incredible Edible started small, with the planting of a few community herb gardens in Todmorden, and today has spin-offs in the United States and Japan. Incredible Edible Todmorden empowers ordinary people to take control of their communities through active civic engagement. Pam has previously served as a member of the Board of Natural England, where she was the lead non-executive board member working on the Countryside & Rights of Way Bill, and Deputy Chair and Acting Chair of the Countryside Agency. She was also until recently the Chair of the Board of the Forestry Commission, which advises on and implements forestry policy in Great Britain. She is a Fellow of the Royal Society of Arts & Manufacturing, and chairs Pennine Prospects, a regeneration company for the South Pennines. Pam has also been leader of Calderdale Council, a board member of Yorkshire Forward, and chair of the National Countryside Access Forum and Calderdale NHS Trust. She was awarded CBE in 2005 for services to the environment. Patrick Holden is a pioneer of the modern sustainable food movement and the Founding Director of the Sustainable Food Trust. Between 1995 and 2010 he was the Director of the Soil Association and became a much sought after speaker and campaigner for organic food and farming. He spearheaded a number of prominent food campaigns around BSE, pesticide residues and GM food. More recently, he was a member of the UK Government’s working group on the Foresight report into Future of Food and Farming and is Advisor to the Prince of Wales International Sustainability Unit. Patrick grew up in London but was deeply influenced by a year he spent in California at the beginning of the seventies. He returned to the UK to study biodynamic agriculture and started a community dairy farm in West Wales in 1973. It is now the longest established organic dairy farm in Wales, with a herd of 75 Ayrshire cows – the milk from which is made into raw milk cheese by his son, Sam. He was awarded the CBE for services to organic farming in 2005.